This brand new contemporary four-story hotel is the first of its kind to open in the up and coming downtown Akron, Ohio area where many museums, restaurants and retail establishments reside. Guests can enjoy great amenities including an indoor pool and high-quality fitness center, all while feeling comfortable and relaxed during their stay. In order to make this hotel ideal for guests, appearance is a factor. Guests want to stay in new and modern hotels and that requires exterior buildings to look their best. 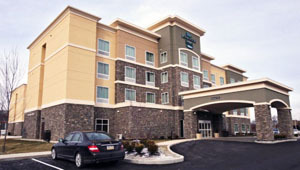 The exterior veneer for this hotel was finished with manufactured stone. To prevent any exterior moisture issues, sustain the longevity of this hotel and to create a profitable asset, the wall design incorporated Keene Building Products’ Driwall Rainscreen drainage mat. Driwall Rainscreen 020-1 provides an airspace between the sheathing and exterior veneer to allow for drainage and ventilation of the wall system. Driwall Rainscreen provides an airspace for any incidental moisture penetrations that gets behind the stone, which occurs due to wind driven rain. Driwall Rainscreen allows for moisture to drain to the exterior. Driwall Rainscreen also provides ventilation. When the stone gets wet, it will have the capacity to properly dry. Draining and drying are two extremely important aspects for the proper life span of manufactured stone, and Driwall Rainscreen provides that in one product. By including Driwall Rainscreen 020-1 into this brand new hotel, the mason ensured that the manufactured stone can properly drain and ventilate. Now it is ready for guest to enjoy and stay comfortably.